Fried Onions can transform any dish into a delicacy. Fish Fry is an integral part of Kerala Cuisine. I love Fish Fry and make it whenever I can. One day, I wanted to make something different from the regular Kerala Fish Fry. When I was browsing, I found this lovely recipe for Fish Fry (Meen Porichathu) at JuratesRecipes. 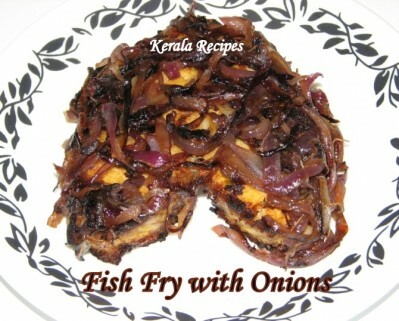 I liked the idea of caramelizing onions and serving it with Fish Fry. So, I went ahead and caramelized onions and added it to my Fish Fry. It tasted out of the world. When onions are caramelized, they bring out a sweet flavor and aroma. It simply tastes wonderful. You can garnish any dish with caramelized onions and it will instantly become savory. I couldn’t resist myself from tasting the caramelized onions and I was scared I would finish up the entire batch. So go ahead and try this Fried Fish with Caramelized Onions. Clean the fish and cut it into medium sized pieces suitable for frying. Soak the pieces in water along with 1 tbsp lemon juice for 5 minutes. This will remove unwanted smell from the fish. Drain and pat dry the fish with paper towels. Prepare a marinade with the above ingredients and apply it on the fish. Allow it to marinate for atleast half an hour. You can keep it in the refrigerator. Heat 1-2 tbsp oil on medium-high heat in a big non stick pan. Add onions and stir so that all slices are coated with oil. Stir the onions every 4-5 minutes and allow it to brown slowly. The longer you fry the onions, the tastier it becomes. You will need to be patient while caramelizing onions. It will take time for the onions to brown. Sprinkle little salt or sugar to quicken the process. The onions will reduce to half when it has become brown. Once the onions are soft and golden brown (around 30 minutes), remove from pan and drain onto paper towels. Add more oil to the pan for shallow frying the fish. Place the fish in the pan and fry both sides on medium heat until brown and crisp. Remove the fish and drain on to paper towels. Cover the fish with caramelized onions and serve it with Rice or as an appetizer.